He wants company law to be changed to protect workers from “rogue employers”. GERRY ADAMS HAS said there were “serious conflicts of interest” surrounding the sale of Clerys, leading to the loss of over 400 jobs. Speaking in the Dáil today, the Sinn Féin Leader highlighted what he called “sharp practice” in the run up to the sale and the involvement of individuals and companies in various aspects of the deal. Adams said company law needs to be changed to protect workers from “rogue employers”. “As is now known, Boston-based vulture capitalists Gordon Brothers bought Clerys in 2012 for a figure believed to be around €2 million. This sale was made possible by Bank of Ireland writing off €10 million of Clerys debts and lending the same amount to Gordon Brothers. “In July 2013, 80 staff were laid off at Clerys while Gordon Brothers received around €14 million in insurance for flood damage. Adams stated that Gordon Brothers separated the department’s retail business from its property assets by setting up OCS Operations and OCS Properties, before selling the latter for €29 million to Natrium Ltd, which was incorporated on 27 May as a vehicle for the purchase of Clerys assets, last week. Natrium Ltd, which now owns Clerys, is a joint venture between Cheyne Capital Management and D2 Private. A senior executive at Cheyne is a former NAMA executive. D2 is run by a former KPMG employee. KPMG are also the Special liquidators at Clerys. KPMG also featured in the IBRC scandal and the sell-off its assets. Adams stressed that he was not implying any illegality took place, saying the practice is “entirely legal” under company law introduced by Fine Gael and Labour. The Louth TD called on Enda Kenny to support a bill proposed by Sinn Féin’s Peadar Toibín that seeks to amend the legislation. In response, the Taoiseach said: “Company law in its entirety is quite a complex document,” and noted thatthe government introduced legislation last year that had been “in gestation over a number of periods of government over the last decade”. Kenny said it would be “more appropriate” for the company law review group to “look at this particular issue to see if it’s appropriate that some changes are made”. He noted that Jobs Minister Richard would advise on this “in due course”. Kenny added that employees, some of whom had given four decades of “loyal service”, had been subjected to “insensitive treatment”. Adams went on to say Clerys “is the latest example of a culture of golden circles, insiders and inequality which has so angered Irish citizens in recent years”. “Previous D2 investors have included Sean Fitzpatrick of Anglo-Irish Bank and a former Fine Gael Attorney General. Liquidators KPMG have also worked as auditors for D2 Private. So Clerys liquidators also worked for the purchaser. There appears to be clear conflict of interest issues here. “Insiders, golden circles, sharp practice. All legal under Company Law introduced by Fine Gael and Labour. The law allows workers to be shafted while the protected elites make massive profits,” Adams stated. Email “Gerry Adams says there were "serious conflicts of interest" in Clerys sale”. 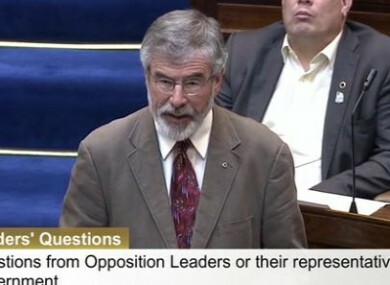 Feedback on “Gerry Adams says there were "serious conflicts of interest" in Clerys sale”.